Prior to installing the AD connector on the connector server, please ensure that the connector server is installed is installed. Please click here for more details on installation of connector server. 1. Stop the Connector Server. 2. From the installation media, copy the ActiveDirectory.Connector-1.1.0.6380.zip file from the bundle directory to the CONNECTOR_SERVER_HOME directory. For Example: C:\Program Files\Identity Connectors\Connector Server. 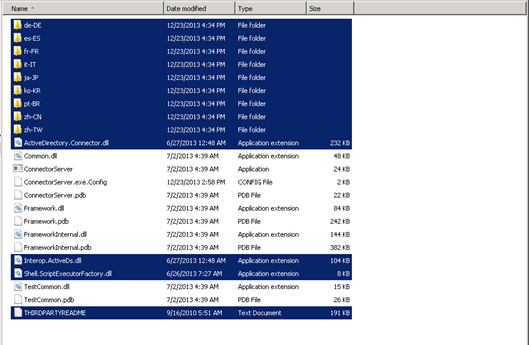 And unzip the ActiveDirectory.Connector-1.1.0.6380.zip file there. The contents of zip file should be directly in Connector Server directory. 3. Delete the zip file and start the Connector Server Service for the connector bundle to be picked up by the Connector Server.